With musical influences ranging from the floating spacemusic of the Berlin School to the breathing thought tones of the American soundscape scene, Rudy Adrian's music is comprised of introspective layered washes of gently drifting sound accented by focused synth patterns and melodies. His albums The Healing Lake, Irridescence, Kinetic Flow and Twilight all show remarkable versatility, have all received international critical acclaim and are realizations influenced through Rudy's love of the natural world. 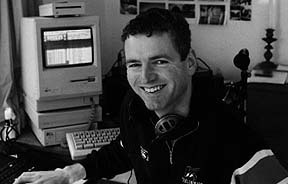 A successful planetarium soundtrack composer as well as studio sound engineer in his homeland of New Zealand, Rudy Adrian discovered electronic music while studying forestry science and botany at university in the '90's. 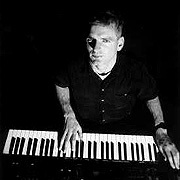 The common thread to his music is the exploration of the sonic landscape, where melody and rhythm play a lesser role to the tones and textures created by synthesizers, wood flutes and the human voice. Always experimental and original, they are also peaceful and listenable - similar to the idea of a film soundtrack without pictures. Rudy Adrian made his stateside concert debut on 21 September 2002 at The Gatherings Concert Series - Philadelphia's premiere concert series of innovative music. 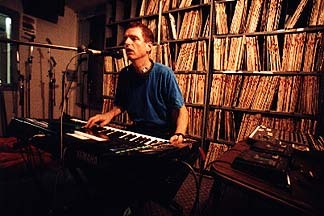 Following the concert, Rudy gave a live in-studio radio concert on the 09.22.02 broadcast of STAR'S END. An excerpt of his in-studio performance appears on the STAR'S END 30th Anniversary Anthology CD. 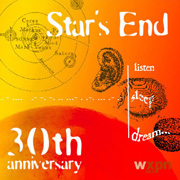 To mark 30 years of continuous broadcast of STAR'S END, WXPN is releasing the STAR'S END 30th Anniversary Anthology CD. This double CD contains over 120 minutes of live music from 12 renowned artists. The unique performances were culled from on-air in-studio radio concerts by some of our community's greatest talents. Included on the disc are previously unreleased live selections donated by: The Ministry of Inside Things, Orbital Decay, Ian Boddy, AirSculpture, Radio Massacre International, Robert Rich, Rudy Adrian, Jonn Serrie, Jeff Pearce, Saul Stokes and Steve Roach. It's rare to find a musician who is adept at both drifting ambient soundscapes and driving rhythmic Berlin school sequencing, but Rudy Adrian is just such an individual. Though this album mostly features shapeless, shifting, languid pools of sound, tracks two and four will make a sequencer enthusiast feel right at home. Given the soothing, reflective "Eclipse," one is almost caught unaware by "Towards the White Mountains," which immediately has a deep, pulsing undercurrent to get things going. There is a sense of dramatic tension, then some very nice layering of brighter synth sounds and percolating percussion over the top. A couple more sequences are added, and the mix of sounds is complete, blending beautifully into an excellent example of the classic electronic style pioneered by Tangerine Dream. Most of the rest of the disc is very relaxing ambient music, all very good, and in a nice variety of styles. "Enveloping Mists" is comparable to early works by Michael Stearns. "Return to Fire Island" is darker, with echoing flutes, much like Robert Rich's work. "Disturbed Reflections" is delicate piano and atmospherics, reminding me of Tim Story. But these are points of reference only, and not intended to suggest that Adrian is merely parroting these styles. Twilight is a very strong musical effort from someone I look forward to hearing more from. New Zealander Rudy Adrian showed a sneak preview of things to come on his more ambient release, Twilight. This time, though there are great ethereal passages of slow space music, they almost always lead to a heavenly build up of electronic layers that is truly fantastic for any fan of the Teutonic style. Case in point is "The Legacy of Luxor," which starts soft and slow. Beautiful, thick pads are soon joined by a deep pulse, which slowly brightens. Occasional wordless vocals in the distance enhance the proceedings, as the sequencers take center stage. Bright synths toward the end complete a perfect rendering of T Dream circa 1980, capturing the essence of that time without blatantly ripping it off. Though the Berlin school style radiates from the speakers like the return of an old friend, the music somehow breathes new life into this now familiar well-worn genre. The most wonderful crystalline tones open the stunning 19-minute title track. The sounds used seem familiar, and yet fresh and vibrant. A marvelous sequence much in the style of Airsculpture or RMI begins just past the 4:30 mark, and from there it quickly gains momentum. Sounds very reminiscent of TD's Tangram emerge. This track has a few distinct movements. The main sequence fades, allowing atmospherics to float around a bit, then the sequence reemerges, then it fades again. Finally, the tease ends, and the stops are pulled for the finish, intense but not over the top at all. A breathtaking centerpiece to an excellent CD, but only one of many strong points. "Turquoise" is delicate and playful, sounding almost like a child's wind-up toy, again with the most delightful sounds. "Le Songe du Singe" is a very spacious 13-minute track, conspicuous by its lack of sequencers on a disc full of them. This only serves to make it stand out as a great space music piece bridging some of the more energetic passages. I've barely touched on but a few of the many, many high points on this CD. If you like Berlin school, you simply must own this CD. I really admire musicians who have the ability to do multiple styles of music, and do them well. 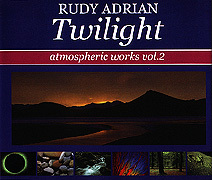 Rudy Adrian's first release, Twilight, blended soothing ambient and slightly tribal textures, similar to Steve Roach, Robert Rich, and A Produce, and did it very well. 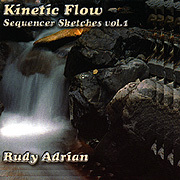 A couple of tracks on that album featured strong sequencing, and his passion for this style of music became the basis for Kinetic Flow: Sequencer Sketches Vol. 1, an excellent burst of Berlin school energy, with more structured melody and composition than most. 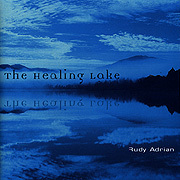 Released about the same time as Kinetic Flow, The Healing Lake shows Adrian even more relaxed and flowing than on Twilight, and the result is an incredibly strong entry in the atmospheric space music category. This is the perfect accompaniment to meditation, relaxation, or just plain spacing out. Though the title and packaging suggest a new age flavour, and this should indeed appeal to fans of that genre, the sparse, expansive nature of the music is sure to please ambient and space music fans. Descriptive titles like "Valley of Mists" convey very well the feeling of each piece. This track breathes slowly, as long sweeping sounds float over cool effects and electronics. The music reverberates deeply, and is incredibly soothing, but not at all cute or contrived. Occasional nature sounds are used effectively. The disc opens and closes with the sounds of water, and thunder begins "Shelter from The Storm". Though again very relaxing, this one has a tinge of darkness. The delicate nature of it reminds me of some of EnoÕs atmospheric work, with perhaps a hint of Jonn Serrie as well. A variety of sonic textures are used throughout. "Night Sky" has rich, low drones, followed by "Clouds Part to Reveal Distant Mountains", which opens with the strains of flutes and just the slightest touch of percussion, giving it a Native American feel perhaps. "Beneath the Stars" is surprisingly dark, along the lines of darker Robert Rich material. "Dreaming of Winter" continues the mood, which lightens again for the closing two tracks, though themes of nighttime and winter predominate throughout. The music is beautifully put together, full of imagery, and thoroughly enjoyable to listen to again and again. Highly recommended. Many thanks to Don Knabb, Rudy Adrian, Art Cohen and NothinBut Net for their key efforts in making this interview available from this website.